A web browser (commonly referred to as a browser) is a software application for accessing information on the World Wide Web. Each individual web page, image, and video is identified by a distinct Uniform Resource Locator (URL), enabling browsers to retrieve these resources from a web server and display them on the user's device. A web browser is not the same thing as a search engine, though the two are often confused. For a user, a search engine is just a website, such as google.com, that stores searchable data about other websites. But to connect to a website's server and display its web pages, a user needs to have a web browser installed on their device. The first web browser, called WorldWideWeb, was invented in 1990 by Sir Tim Berners-Lee. He then recruited Nicola Pellow to write the Line Mode Browser, which displayed web pages on dumb terminals; it was released in 1991. 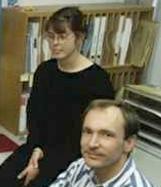 Nicola Pellow and Tim Berners-Lee in their office at CERN. 1993 was a landmark year with the release of Mosaic, credited as "the world's first popular browser". Its innovative graphical interface made the World Wide Web system easy to use and thus more accessible to the average person. This, in turn, sparked the Internet boom of the 1990s when the Web grew at a very rapid rate. 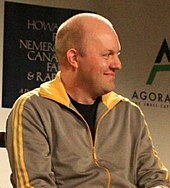 Marc Andreessen, the leader of the Mosaic team, soon started his own company, Netscape, which released the Mosaic-influenced Netscape Navigator in 1994. Navigator quickly became the most popular browser. Microsoft debuted Internet Explorer in 1995, leading to a browser war with Netscape. Microsoft was able to gain a dominant position for two reasons: it bundled Internet Explorer with its popular Microsoft Windows operating system and did so as freeware with no restrictions on usage. Eventually the market share of Internet Explorer peaked at over 95% in 2002. WorldWideWeb was the first web browser. In 1998, desperate to remain competitive, Netscape launched what would become the Mozilla Foundation to create a new browser using the open source software model. This work evolved into Firefox, first released by Mozilla in 2004. Firefox reached a 28% market share in 2011. Apple released its Safari browser in 2003. It remains the dominant browser on Apple platforms, though it never became a factor elsewhere. The last major entrant to the browser market was Google. Its Chrome browser, which debuted in 2008, has been a huge success. It steadily took market share from Internet Explorer and became the most popular browser in 2012. Chrome has remained dominant ever since. The purpose of a web browser is to fetch information resources from the Web and display them on a user's device. This process begins when the user inputs a URL, such as https://en.wikipedia.org/, into the browser. Virtually all URLs on the Web start with either http: or https: which means the browser will retrieve them with the Hypertext Transfer Protocol. In the case of https:, the communication between the browser and the web server is encrypted for the purposes of security and privacy. Another URL prefix is file: which is used to display local files already stored on the user's device. Once a web page has been retrieved, the browser's rendering engine displays it on the user's device. This includes image and video formats supported by the browser. Web pages usually contain hyperlinks to other pages and resources. Each link contains a URL, and when it is clicked, the browser navigates to the new resource. Thus the process of bringing content to the user begins again. To implement all of this, modern browsers are a combination of numerous software components. Web browsers can typically be configured with a built-in menu. Depending on the browser, the menu may be named Settings, Options, or Preferences. The menu has different types of settings. For example, users can change their home page and default search engine. They also can change default web page colors and fonts. Various network connectivity and privacy settings are also usually available. During the course of browsing, cookies received from various websites are stored by the browser. Some of them contain login credentials or site preferences. However, others are used for tracking user behavior over long periods of time, so browsers typically provide settings for removing cookies when exiting the browser. Finer-grained management of cookies requires a browser extension. The most popular browsers have a number of features in common. They allow users to set bookmarks and browse in a private mode. They also can be customized with extensions, and some of them provide a sync service. Allow the user to open multiple pages at the same time, either in different browser windows or in different tabs of the same window. Back and forward buttons to go back to the previous page visited or forward to the next one. A refresh or reload button to reload the current page. A home button to return to the user's home page. An address bar to input the URL of a page and display it. There are also niche browsers with distinct features. 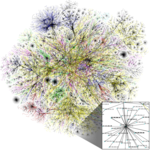 One example is text-only browsers that can benefit people with slow Internet connections or those with visual impairments. Most used web browser by country, as of June 2015. ^ "What is a Browser?". Google (on YouTube). 2009-04-30. Less than 8% of people who were interviewed on this day knew what a browser was. ^ "No-Judgment Digital Definitions: Internet, Search Engine, Browser". Mozilla. 2017-10-11. Let’s start by breaking down the differences between internet, search engine, and browser. Lots of us get these three things confused with each other. ^ "Tim Berners-Lee: WorldWideWeb, the first Web client". W3.org. Retrieved 2011-12-07. ^ a b "Bloomberg Game Changers: Marc Andreessen". Bloomberg. 17 March 2011. Retrieved 2011-12-07. ^ Enzer, Larry (August 31, 2018). "The Evolution of the Web Browsers". Monmouth Web Developers. Retrieved August 31, 2018. ^ "Mozilla Firefox Internet Browser Market Share Gains to 7.4%". Search Engine Journal. 24 November 2004. Retrieved 2011-12-07. ^ Stewart, William. "Web Browser History". Retrieved 5 May 2009. ^ a b "StatCounter Global Stats – Browser, OS, Search Engine including Mobile Usage Share". Retrieved 2 May 2015. ^ "Internet Explorer usage to plummet below 50 percent by mid-2012". 3 September 2011. Retrieved 4 September 2011. ^ "StatCounter Global Stats – Browser, OS, Search Engine including Mobile Usage Share". Retrieved 2 May 2015. ^ "Behind the scenes of modern web browsers". Tali Garsiel. Retrieved 12 October 2013. ^ a b "Tracking Cookies: What They Are, and How They Threaten Your Privacy". Tom's Guide. Retrieved 11 March 2019. ^ "Alternatives to Cookie AutoDelete extension". AlternativeTo. Retrieved 11 March 2019. ^ "Desktop Browser Market Share Worldwide". StatCounter. This page was last edited on 9 April 2019, at 10:14 (UTC).